In the aftermath of the August 2013 mining protests in China, the group of researchers sent to investigate environmental situation in the Tibetan Autonomous Prefecture encountered difficulties by being sent to wrong sites and not being allowed to interview the local population. Journalists and researchers sent by China’s central government to investigate conditions in a Tibetan-populated mining area in Qinghai province have been blocked in their work by local officials, who sent them to the wrong sites and stopped them from speaking to local residents, sources say. The group had been assigned to look into reports of environmental damage in the Yulshul (in Chinese, Yushu) Tibetan Autonomous Prefecture’s Dzatoe (Zaduo) county, where local Tibetans clashed with security forces in August over Chinese mining operations, a Tibetan living in India told RFA’s Tibetan Service this week. “Some groups of reporters tried to visit the mines, but they were not taken to places where Chinese miners are actually extracting minerals,” the source, Konchog Dondrub, said, citing contacts in the Dzatoe area. “Instead, they were taken to other sites in an attempt to convince them that mining is not harming the local environment,” he said. County officials also prevented the group from speaking freely to area residents, arranging instead for people of their own choosing to be interviewed, Dondrub said. “Reporters never met the local Tibetans who had protested Chinese mining in their area,” he said. On Aug. 15-16,  hundreds of Tibetan villagers blocked work at three mining sites—Atoe, Dzachen, and Chidza—in Dzatoe county, sparking a crackdown by at least 500 armed police, according to area sources. Mining operations in Tibetan regions have led to frequent standoffs with Tibetans who accuse Chinese firms of polluting the environment and disrupting sites of spiritual significance. 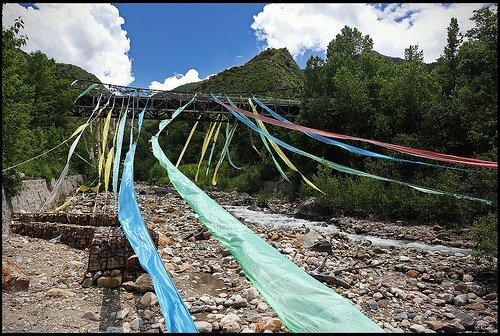 Tibetan residents of Dzatoe have long regarded the mountains in their area targeted for mining as the abodes of protective deities, and documents appearing to give central government approval for the work were later found to be fakes, one source said. “So this year, the Tibetans were determined to resist the mines,” he said. Now, Tibetans selected by county officials to replace village leaders fired from their jobs last month are refusing to take up their new posts, Dondrub said. The former village chiefs had “complained against the government” following the Chinese security crackdown in August , which left dozens injured and saw several detained. “The replacements for the leadership positions of Atoe, Dzachen, and Chidza villages have also refused to work as village leaders,” Dondrub said, adding that one former village chief, Khetsa Soetob, has been ordered to surrender to authorities. “He was told that if he fails to do so, he could be sentenced to death or to a life term in prison,” Dondrub said. Sporadic demonstrations challenging Beijing’s rule have continued in Tibetan-populated areas of China since widespread protests swept the region in 2008. A total of 122 Tibetans in China have also set themselves ablaze in self-immolation protests calling for Tibetan freedom, with another six setting fire to themselves in India and Nepal.